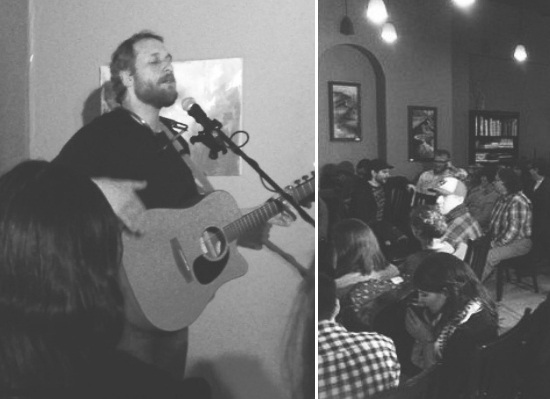 On Friday night, Mike and I went to Cafe Natura to see Craig Cardiff play. I pulled out my favourite long sleeved LBD for the occasion! 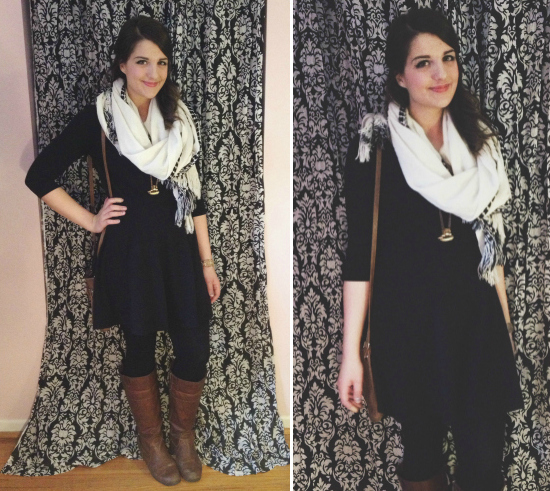 This one is a closet staple that I normally tend to pair with a belt and tights. 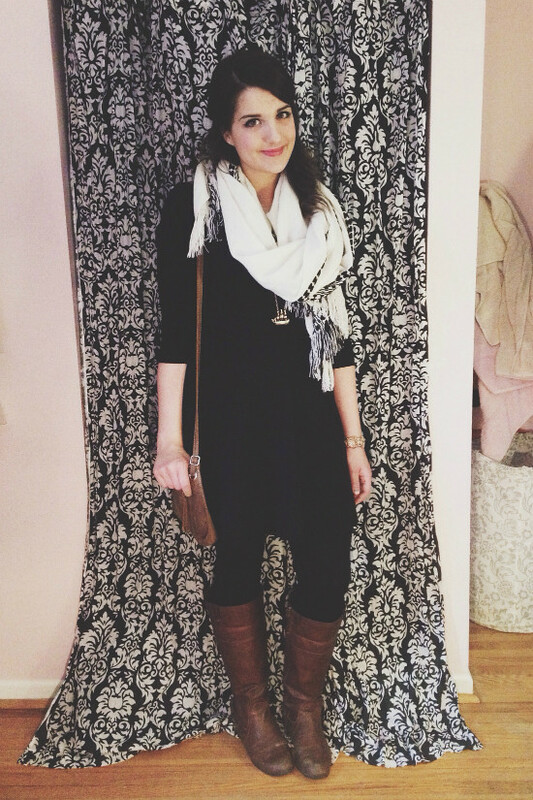 This time around, I swapped the usual belt for a lovely scarf that Laura bought me, and added some red(dish) lipstick. The show was amazing. I've heard of Craig's excellence before, but never really picked up any of his stuff for a listen. I have been missing out!! He is easily one of the most brilliant musicians I've seen live. He played a large assortment of creative songs using a loop pedal, as well as many sad songs that had me (literally) sobbing (actually super embarrassing). He also had hilarious and interesting commentary. For a few songs, he taught the audience the chorus so everyone could sing along, which added a really cool choral-type layer to his music and also made the soul happy. 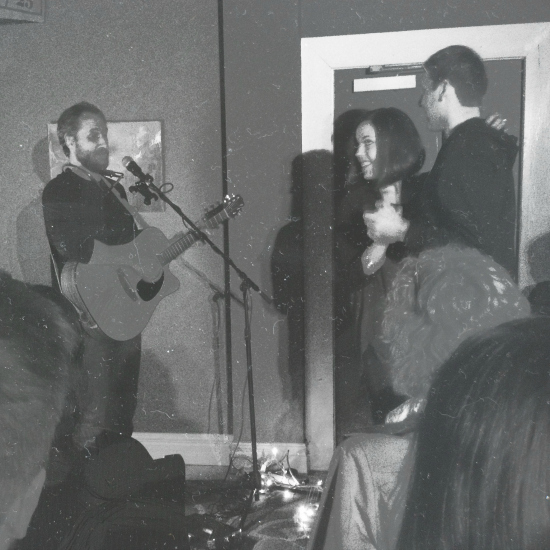 He asked a couple in the audience if they could slow dance to make a song prettier. It worked. It was beautiful. My face was wet from so many tears. If you ever get the chance to see Craig Cardiff play live, GO. You will not regret it. He is seriously brilliant. For now, I encourage you to take a listen to this beautiful tune and then also go search him up on YouTube or Facebook or whatever your fancy. Just Google him, seriously. After the show, we met up with Josh and Laura and went on an impromptu trip to the casino. It was random and hilarious and an interesting switch from our usual food/ movie/ drive nights. We signed up for the Winner's Circle and all lost our $5 vouchers (and then some hehe). I love having those two in town and I am going to pretend they aren't leaving for England in September! !